Bullous Pemphigoid is a rare skin disorder characterised by the tense blisters on the surface of the skin. In rare cases, the inner lining tissue of the mouth, nasal passages or the conjunctivae of the eyes can be involved. These blisters can develop on the lower abdomen, upper thighs and on the armpits. This condition is more common in people older than 60 years. This disease needs early and proper treatment to prevent further morbidity or mortality. WHAT ARE THE CAUSES OF BULLOUS PEMPHIGOID? The exact cause of bullous pemphigoid is not known. The painful blisters in bullous pemphigoid occur because of a malfunction in the immune system. The body's immune system normally produces antibodies to fight bacteria, viruses or other harmful foreign substances. The inflammation that causes blisters are produced by the antibodies. The immune system produces antibodies to the fibres that connect the epidermis (outer layer of the skin) and the dermis (next layer of the skin). WHAT ARE THE SYMPTOMS OF BULLOUS PEMPHIGOID? 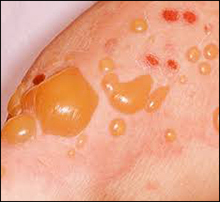 The main feature of bullous pemphigoid is the appearance of large blisters that do not rupture when touched or some people may develop hive-like rashes. Blisters appear on the organs such as lower abdomen, groin, upper thighs and arms. Sores in the mouth may also be developed. The affected areas of the skin may be very itchy as well as painful. To confirm the diagnosis, doctor may perform skin biopsy for laboratory testing. The goal of the treatment is to help the skin to heal quickly and to relieve itching. Modern treatment prescribes certain combination of drugs that inhibit the immune system activities that cause inflammation. Western approach to auto-immune disorders aim at prescribing corticosteroids and other powerful immunosuppressants. The Ayurvedic approach to auto-immune disorders is to strengthen the digestion as well as to put the immune system to rest rather than to suppress it. Therefore, in today's world, we must take few lessons from the ancient sages of Ayurveda for treating incurable diseases and for a new way of life. In Ayurveda, various herbal and herbo-mineral preparations are described which are found to be very effective in curing auto-immune diseases. Ayurveda can be a promising alternative in such types of skin diseases. 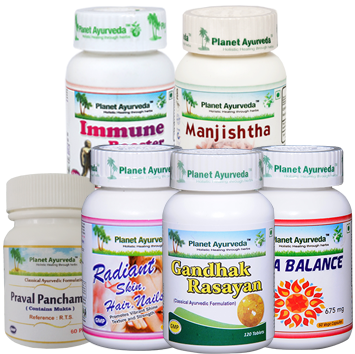 Planet Ayurveda offers various herbal medicines that balance the Vata, Pitta and Kapha doshas in the body. Manjishtha Capsules are prepared from the herb Rubia cordifolia. It is a very famous herb in Ayurveda for blood detoxifying. It is widely used in many skin diseases. It is good for skin, improves complexion and mitigates Pitta dosha in the body. It is useful in diseases of tissues where Pitta dosha is involved such as in skin wounds, skin diseases and eyes. As the name suggests, Pitta Balance Capsules of Planet Ayurveda balance the Pitta dosha in the body that's responsible for causing skin diseases. Pitta Balance Capsules of Planet Ayurveda is a unique combination of various herbs which help to keep Pitta dosha in the balanced state thus help in healing the skin problems from its root cause. As the name suggests, Panchamrit is made up of two words: Panch + Amrit. Pancha means five and Amrit means elixir. The five bhasams present in this medicine act together as elixir. This medicine is a good source of calcium and has a cooling effect on the body. It is mainly used for correcting the digestive disorders and also acts as Rasayana. The word Rasayana means rejuvenation. Gandhak Rasayan is a potent Ayurvedic remedy for all kinds of skin diseases. This herbal medicine has an anti-bacterial, anti-fungal, anti-inflammatory and anti-diuretic properties. It is an anti-aging medicine and improves digestion, skin complexion and immunity. It is indicated in all the skin diseases, itching, depleted immunity. Thus, it is quite effective in treating Bullous Pemphigoid without causing any side effects. Dose: 2 tablets twice or thrice daily. Radiant Skin Hair Nail Formula of Planet Ayurveda is a unique combination of various herbs that help to relieve the skin problems naturally. It is highly recommended for skin diseases associated with eczema and it also responds to chronic non-relieving wounds. This medicine contains unique herbs that act as an appetiser, digestant and vermicide. Immune Booster Capsules help in building the immunity of an individual quickly. It also enhances the body's metabolic rate, flushes out toxins and unwanted materials from the body and cleans the system completely. It also protects the individuals form free radical formation as well. These capsules work naturally and therefore do not cause any side effects.